Rumors picking up that the Yankees and Twins may actually be working out a deal for Francisco Liriano. When some Minnesota papers made mention a couple of weeks ago that the Twins weren't very interested in Liriano longterm, it certainly caught my attention. 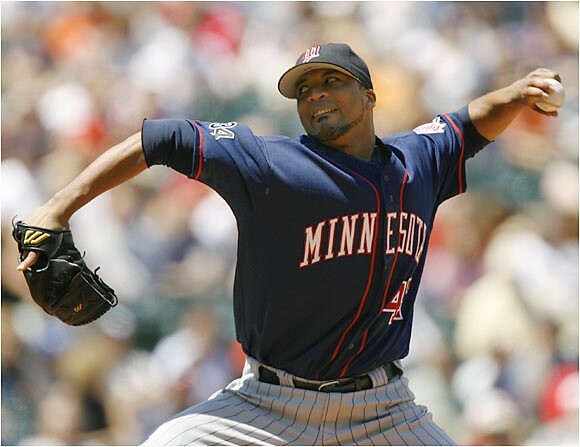 Liriano is not the same guy from 2006 who struck out 144 batters in 121 innings while going 12-3 for the Twins, but still can be a towards the top of a rotation guy for any MLB team. Last year he struck out 201 in 191.2 IP while going 14-10 with a 3.62 ERA and he's still only 27! 27 with quite a few injuries, but still young enough where you can talk yourself into him figuring out how to stay healthy. Heck, AJ Burnett did it. The Yankees need some pitching obviously and if the rumors today are to believed, the asking price may be Joba Chamberlain or Ivan Nova plus some bit parts. While there are still some enamored with Joba (who is competing this spring for the coveted 7th inning spot) and Nova showed something with last year's call-up, neither are deal breakers for the Yankees who all of a sudden seem flush with pitching talent ready to break through to the big leagues (You have to love this time of year when all you read about are the youngsters in camp who all look ready to go). That's a bit better, no? That looks to me like a rotation that's strong enough to get the Yankees through to at least the All-Star break, when the Yanks can evaluate and target pitchers available at the deadline. At least by then, Jesus Montero will hopefully be lighting up the AL and the Yankees won't be able to even entertain getting rid of him, right?